New era at OCADU re-announced: New students will no longer be able to join Facebook’s “OCAD” network. This isn’t new; according to them the last time this was considered was two years ago. 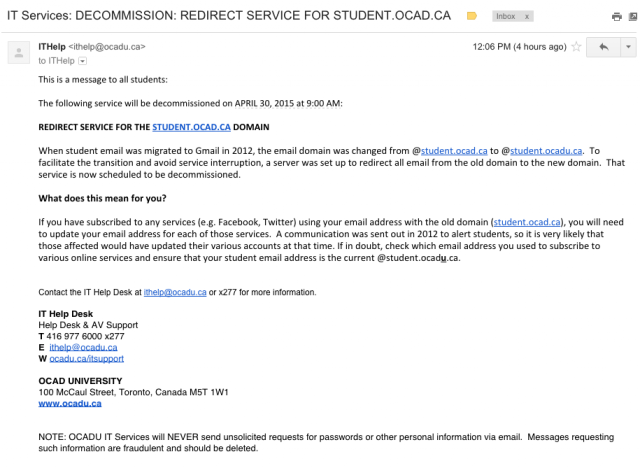 I mentioned on Facebook that this would mean new students would not be able to join the “OCAD” network. They pulled the decommission. Two years later they are announcing the decommission again. So what changed? Maybe they forgot. Or they thought joining a Facebook network isn’t something they should care about. Or maybe something else. I don’t know. Sure, Facebook networks do hardly a thing any more; but it’s still a show of affiliation. April 30, 2015 will still be a milestone in OCAD’s history: Officially denying new students the possibility of showing their sense of belonging to the school by joining a network on Facebook. So three days ago I got an unexpected email that I found incredibly odd, and I’m still mulling what to do next. That said, in the meantime I have talked to a few people and I’m starting to believe this is most likely a result of the “internal verification” that was mentioned more than a month ago. If this is indeed the case, then it can only mean that I’m still very much officially a student, albeit a student who’s not registered in anything. Yesterday was a deadline; I mentioned it on Twitter and that got picked up by Sarah Mulholland because after the initial curiosity I started ranting about OCAD’s new website. But my own personal deadline was not yesterday but the day before, and I never knew there is still an “internal verification” (probably just meaning checking if the profs really signed the forms I turned in). Now that even the rhetorical deadline has passed, I’m not sure what to call myself any more. Danica asked me how I felt when I dropped by at the AV desk today. “Weird,” I told her. And yes, that’s exactly how I’m feeling right now. But that still doesn’t change the fact that my library card has just expired, or that I’m not registered for anything. Nor do I really want to unless there’s some way to register for something without triggering the full grad tuition fees. What can I say? This question of liminality just keeps cropping up. No longer here, but not there yet. Everyone, including my advisor, is asking me about what my plans are. I really just have “some sort of a plan” right now. A time bomb, accidentally discovered? So what essentially happened in the past couple of days was that I have been banned from a studio. The tech specifically requested that I be banned only from his studio, but what happened was that I seem to have been banned from the entire building, including the elevator. The computer does random unexpected things from time to time, possibly when people try to make certain changes (random errors). Any of these reasons are serious, and with the SU office having moved to 205 Richmond they have become more serious than ever. Just imagine, if a student has been unfairly banned from a studio and needs the help of the Student Advocate, they might not actually be able to get to the SU office to get help. Or students could be banned from the SU food bank. Worse, the entire SU staff could be shut out from their own office for no reason. I think this needs to be looked into as soon as possible, before the Fall semester kicks in and make this problem one that potentially affects >4000 OCAD students. You know, I have never felt a connection to 205 Richmond, even though that’s supposed to be my building. But how could anyone blame me? If all a student could do is to go into the building to borrow the wifi and the bathroom (and it’s just the wifi and not even a power outlet), it would be a miracle the student felt any connection. So what does it mean to have the privilege of borrowing the bathroom revoked too? Can anyone say “Not much, I suppose”? Anyway, since this ridiculous thing has actually happened I’ll have to say it’s a good thing that the Student Union moved into this building and literally took over half of the fifth floor. Honestly I used to think it was a bad idea that they moved here since it’s so far away (for most students and ironically that also includes me, since my home base is not 7220 but 253). But I think the move has accomplished something very important, namely to—what’s the right word? “detoxify”? “cleanse”?—anyway, to make the environment feel less intrinsically hostile. I really hope the SU will do well here. In a sense, I really hated this building. And yes the SU moving there really sort of caused it harder to hate it as a whole.